We make our Eaux-de-Vie, or brandies, from the fruit of the Alsace terroir provided by our orchardists. So it’s imperative that the raw product, the fruit, is intact and rich in fragrance, sugar content and taste – also the qualities of the final product. Here’s how we make our Wolfberger Eaux-de-Vie Alsace. Fermentation or maceration? The decision is made according to which fruit we’re talking about. For fruit high in sugar content (cherries, Willams pear or Bartlett pear, red plums and cherry plums), we choose fermenting. The fruit is carefully crushed, leaving the pits intact, to make the mash that will be pumped into the vats. The natural yeast content in the fruit does its work little by little, transforming the sugars into alcohol. On the other hand, for fruit with low sugar content like raspberries or other red berries, we choose maceration. This method lasts several weeks, during which the fruit is soaked in a subtle mix of maceration alcohols whose recipes have been handed down to our distillers from one generation to the next. Our master distillers’ secrets are used during this step, revealing the real spirit of the fruit and the unique character of the Eaux-de-Vie. 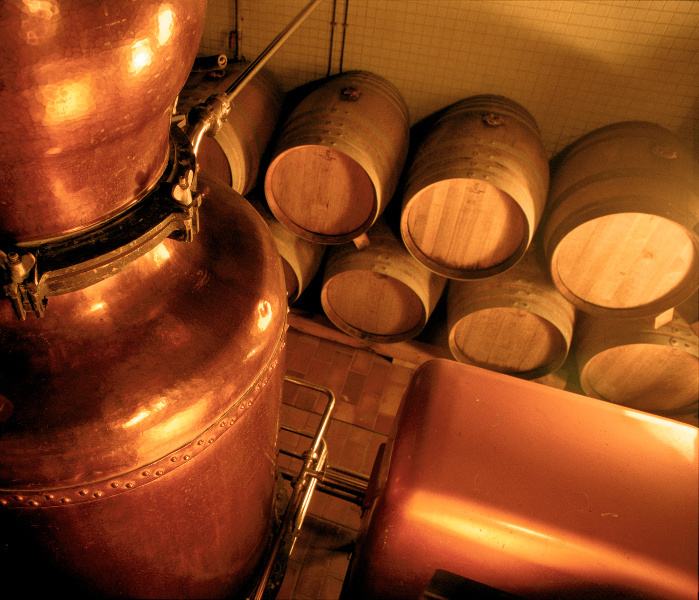 Once the fruit mash has been macerated or fermented, it’s pumped into a copper still and is heated in order to release all the aromas. The aging time varies depending on the desired results. The master distiller can then use his experience with the recipes, the fruit and his own know-how to manage the quality of the final product. All the “hearts” of the distillations are aged in stainless steel vats to attain optimal aromatic quality and intensity and to preserve the transparence of the white Eaux-de-Vie. It’s also a skillful mix of our distilling techniques that will decide the particularities of our Eaux-de-Vie and allow us to offer you high-quality products made for keeping. At Wolfberger, quality isn’t achieved during the aging process but rather with our blending techniques and the fruit (identical to our wines and crémants). Our Alsace Eaux-de-Vie are bottled in what’s called the “flûte d’Alsace”, a tall, slender bottle. The bottling line is used for the Eaux-de-vie Framboise (raspberry), Poire Williams, Mirabelle (cherry plums), and Quetsch (red plums) while the smaller volumes are bottled manually. Our Alsace Liqueurs and Crèmes de fruits are created by our liqueurists, following to the letter the recipes that are locked away safe from indiscreet eyes. The Liqueurs and Crèmes are a blend of fruit juice, Eaux-de-Vie and sugar syrup. The Liqueurs have different alcohol contents. The secret recipes of our master liqueurists allow us to create perfect blends following precise dosages. Finally, sugar is added to lower the alcohol content and increase the aroma and the taste of the fruit. The product then has to be filtered to get a pure liqueur. 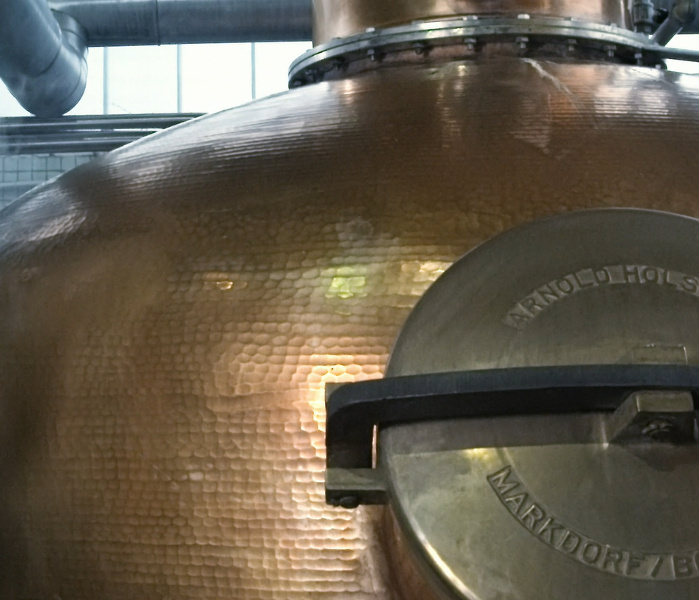 This method called "one pass" consists of distilling only once. 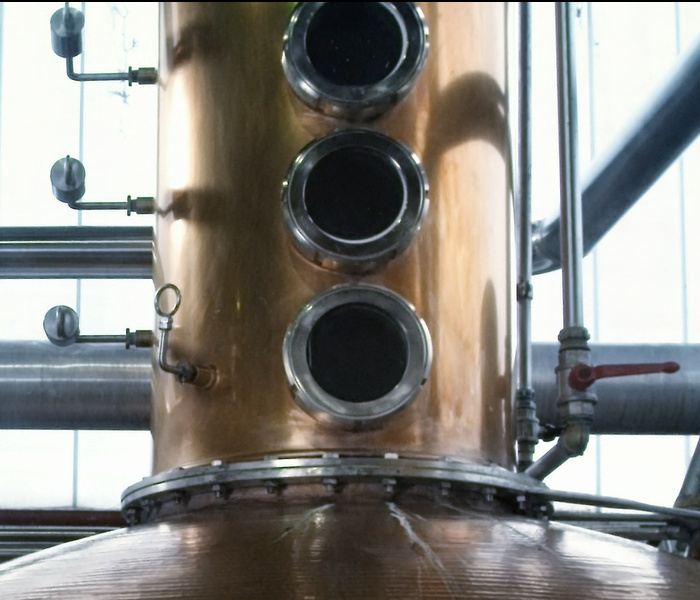 This method called "double pass" is based on two distillations to refine our Eaux-de-Vie.